As he travels around the state campaigning for Republican candidates, Kentucky Commissioner of Agriculture consistently sees one thing that gets him down: "I see one thing that's always a little depressing. We have good crowds but they're older people." The first-term Republican, who is mulling an ambitious run of his own in 2015 for the Governor's Mansion, was excited by what he saw in Covington on Tuesday night. "To see this young, professional, energetic crowd, it gives me a lot of confidence," Comer said. 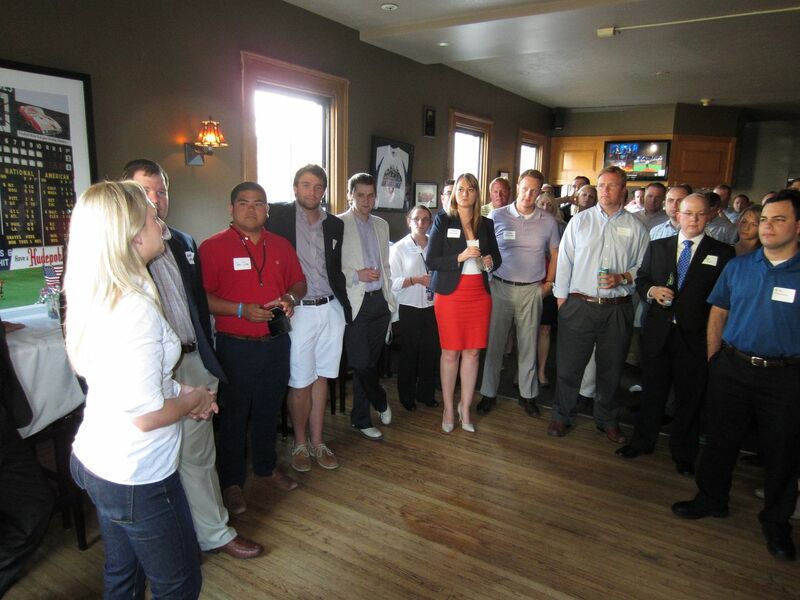 The Northern Kentucky Young Republicans hosted its first event at Keystone Bar & Grill and featured the young Agriculture Commissioner as its keynote speaker. A packed crowd of mostly younger conservatives heard from Comer, 41, Congressman Thomas Massie, 43, and State Senator Chris McDaniel, 37, three rising stars of the Republican Party. A youthful energy and increased voter turnout in Northern Kentucky could lead to more statewide victories for Republicans. Currently, Comer is the only Republican to hold a Kentucky Constitutional office. "This is the key to electing more Republicans statewide," Comer said. "This is the sleeping giant, Northern Kentucky." "You're doing everything right," Comer continued, pointing to job creation at a rapid pace, what he called great legislators, and his favorite Congressman, Massie. He said Northern Kentucky is outgrowing other parts of the state because it is controlled by Republicans. "We can do that in other parts of Kentucky if we get voter turnout up in this part of the state," he said. Comer acknowledged other younger Republicans who hold office in Kenton County including newly minted Republican nominee for Judge-Executive Kris Knochelmann (who will likely be unopposed in November), Commonwealth's Attorney Rob Sanders, Republican nominee for County Attorney Stacy Tapke, and Circuit Court Clerk John Middleton. "This is going to be a game-changer for the future of Kentucky," Comer told the enthusiastic crowd. "When Northern Kentucky turns out like Fayette and Jefferson, overnight Kentucky becomes a conservative, business-friendly state." "We can make a difference and tonight is a first step." Massie also acknowledged the need for younger Republicans to buck the Party's stereotype. "Don't let anybody stereotype you. People try to put you in a box. You don't belong in a box," the first-term Congressman said. He shared a story of how he showed up in DC in an electric car, something more commonly associated with liberals, but he saved face with his "Friends of Coal" license plate. "You can be a Republican and be cool," Massie said, adding that to that effect, he would be accepting Bitcoin donations. He also pointed out that he has more "likes" on Facebook than any freshman Democrat in the US House. "What Kentucky needs is a vibrant, young Republican governor," the Congressman said in a possible nod to Comer. The youthful McDaniel, who replaced the retired educator Jack Westwood in the State Senate, played to that theme. "If we're going to address the issues facing our generation in a conservative manner, it's going to take the next generation standing up and saying we're going to make a difference," he said. That's what the new Northern Kentucky Young Republicans aim to do. "I find it hard to believe that young people don't care about liberty, the Constitution, and economic freedom," the chapter's president, Sarah Cameron, said. "I know that's not true because of the young people in this room."